It was very rewarding to jump in the car at 7:28AM with ambient temperature at 7ºF /-14ºc & embark on another spectacular drive. 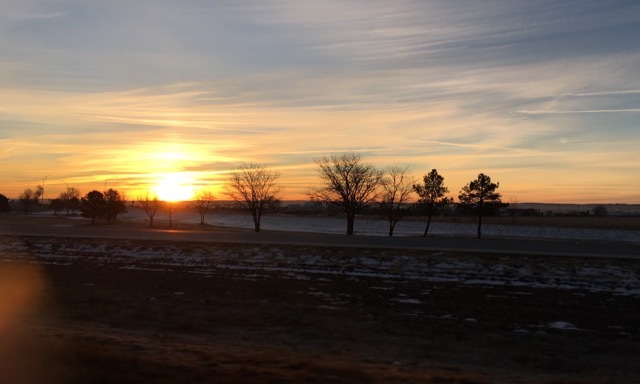 First the sun rose in our backs as we left Nebraska & then huge gorgeous clear skies welcomed us into Wyoming. Shortly after our gas-&-trucker-materials pit-stop, we made a further stop at a look-out to catch the views. We were surprised to meet up with a very famous tree that grows out of a boulder of pre-historic rock. The Tree Rock is located right between Cheyenne and Laramie plumb in the middle of Interstate 80, literally hugged between its east- and west-going lanes. As read on one of the The Tree Rock —a.k.a “the lone tree”— tourist-info tablets, the transcontinental railroad tracks of the Union Pacific Railroad lie a short distance to the west, as lies the Ames Monument, erected to commemorate the highest point of the railroad’s route honor the Ames brothers. I remembered very well that Augustus Saint-Gaudens had chiseled the bas-reliefs —from Quincy, Massachusetts, granite! — & architect H. H. Richardson designed the pyramid (as well as the Albany City Hall!) I have worked on several project on Augustus Saint Gaudens & even though this is not my favorite work of his, I was delighted to find his work here, since I have seen almost all ASG public works. We continued our journey towards Rock Spring thru more beautiful landscapes where the speed limit went up to 80 miles p/h! I will never forget the golden pale yellows of the endless prairies illuminating the snow, the light blue sky & the pinkish granite boulders. Our picnic at the Ames monument was a little less fancy today —since we are starting to run out of provisions— but was still nourishing: hummus, bread, cheese, apples & nuts. Tonight we went out to dinner at a local restaurant (attracted at first by the name, The Coyote Creek Steakhouse) where Pierre had a decent sirloin, turned down all five of the offered potato-versions, settling for green beans while & I had a bison burger — sans buns but with more green beans. Today we also passed the 2000 miles marker. One more day on the road before Boise. Tomorrow through Pocatello to give a thought to Pierre’s old friend Ed Dorn & on to Blackfoot to visit the potato museum. I will miss your daily update, photos and thoughts. Any chance you can keep this going? Good to know someone at long last had a burger. I will try my best, maybe a food diary for my students.